Most adult learners and other nontraditional students pursue higher education to create change. For people to realize a meaningful change, they must be both willing and able to work toward it. Individuals willing to pursue further education also need affordable and convenient access to it. KUEC works closely with area K-12 school districts, high schools and community colleges to create and enhance educational pathways. Employers engage KUEC to educate current and future employees. And, KUEC continues to expand access to high-quality education through its Leavenworth location and globally through online programs. A new agreement between KU and Metropolitan Community College significantly reduces the financial and time commitment barriers community college students face in completing their education at a four-year institution. 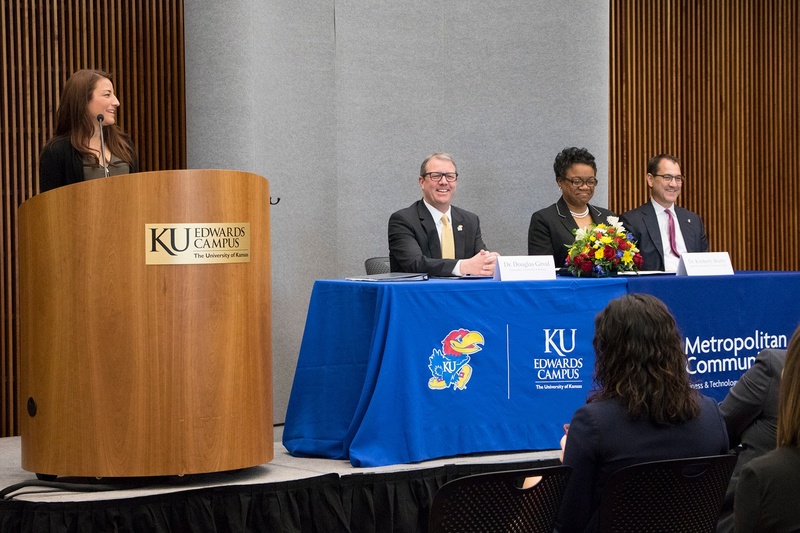 Higher education, K-12 and community leaders from both sides of the state line gathered at KUEC to witness MCC Chancellor Kimberly Beatty, Ed.D., and KU Chancellor Douglas A. Girod, M.D., sign a proclamation during a historic event on April 23. An associate degree from MCC now satisfies KU Core requirements 1-3, streamlining a pathway to a KU bachelor’s degree. Jessica Hammer, a senior in exercise science at the KU Edwards Campus (KUEC) who transferred from MCC-Longview, addresses the crowd, including at the table from left, KU Chancellor Douglas A.
Girod, M.D., MCC Chancellor Kimberly Beatty, Ed.D., and KUEC Vice Chancellor David Cook, Ph.D.
On June 12, participating schools will sign an official agreement for the Degree in 3 program, which allows students to earn college credits in high school and earn their bachelor’s degree within three years from graduation.This program can save students thousands of dollars off the total cost of earning a bachelor’s degree, allow them to stay in Kansas City and expedite their entrance into the workforce. Degree in 3 is a partnership between Blue Valley Schools, Kansas City, Kansas Public Schools, Olathe Public Schools, Shawnee Mission School District, Southland CAPS, Summit Technology Academy, Johnson County Community College, Kansas City Kansas Community College, Metropolitan Community College and KUEC. Current Degree in 3 bachelor's degree options include biotechnology, business, exercise science, information technology, law and society, molecular biosciences and public administration, with more under consideration. Program faculty and staff offer activities throughout the year when high school students come to campus to engage with the same instructors who teach the college courses. Students discover possible education and career paths for these degrees. KU in Leavenworth recently announced it will expand its classroom space to accommodate growing enrollment and course offerings. The new space opens in fall 2018 and will serve the community’s military and civilian populations. 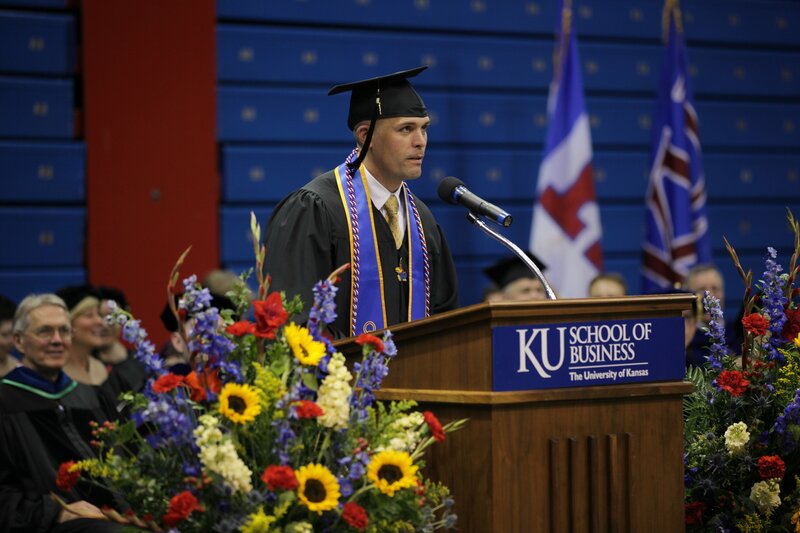 This month, KU celebrated a large graduation class from its programs in the city of Leavenworth. Learn more and get to know two of the military officers who just received their master’s degrees in business and organizational leadership. For the past 10 years, KU has offered two programs inside Fort Leavenworth: the Master of Science in Business - Supply Chain Management and Logistics and a Master of Arts in Global and International Studies - Interagency Track. In 2016, KU expanded its offerings off-post to include a Master of Science in Homeland Security: Law and Policy; a Master of Science in Business and Organizational Leadership; and a Master of Engineering in Project Management. Continuing one’s education doesn’t necessarily mean earning another degree. KU Professional & Continuing Education offers a broad portfolio of professional development topics and formats, from one-day workshops to technology boot camps to online training. Individuals can also take graduate-level courses without having to apply for admission and commit to a full degree program through KUEC’s open enrollment courses. Faculty from the KU Graduate Certificate in Professional Workplace Communication present free, one-hour Link and Learn seminars, which reveal research-backed strategies to improve teamwork, management and communication at the office. Numerous Kansas City area employers rely on KUEC to deliver professional, continuing, undergraduate and graduate education and credentials to their current workforce. Many of the programs are offered at employer locations and with employer financial support. Watch for more announcements in the coming weeks of innovative and collaborative ways KUEC works with area employers to increase access to higher education. Qualifying individuals in the 11 Missouri counties in the Greater Kansas City area can pursue degrees and certificates at KUEC at tuition rates equivalent to in-state tuition through the MetroKC Rate. Engagement in KUEC’s online programs continues to grow, especially among Kansas City metro residents. Online degree, certificate and continuing education programs allow scheduling flexibility, accommodate family and travel schedules and provide access to students outside of Kansas City. KUEC offers summer camps to keep children’s minds and bodies strong over the summer months. Hawk Fitness Academy starts this week, and Summer STEM Camps begin soon. to KU Edwards Campus News and Events from KU Edwards Campus. The University of Kansas is an equal opportunity/affirmative action institution.